Here we’re showcasing some of the research and academia by the WoMMeN team that goes on in the background so that we can provide you with a well-informed website – come take a look! You’ve visited the site, you’ve seen the team, you’ve looked at all the wonderful stuff we’ve collected along the way – you know, it’s been quite a journey for the WoMMeN team – what do you think of the view so far? 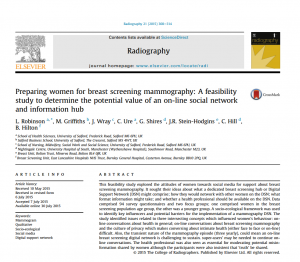 The WoMMeN website is a great source of information about all things mammogram, but it’s taken some work to get it here. For those of us that don’t know us, we’re a team of academics, health professionals and patients who are tirelessly working to provide this information so that #WoMMeN like you are better prepared for their mammogram, and have a safe place to ask questions. Health professionals might wonder what’s on the site for them. Well, you also get a safe space to ask and answer questions, to interact with other professionals like you, and also somewhere to get CPD opportunities – be it reflection on what you’ve read, or an idea for a research project, for example. CPD, those three little letters that all health professionals ought to be chasing as part of their professional registration process. How do you make time for it, though? It’s all study days, isn’t it? Well no. You can reflect on any learning experience, and make that part of your CPD portfolio, and if that’s something as simple as answering someone’s question online, or commenting on one of our posts here and taking part in the discussion which follows, then as long as you reflect on it and learn from it, then that’s CPD. We try and make it easy by keeping up to date with all things breast screening – follow our Facebook page where we’ll be posting things every week that we find across the web. Come and say hello! 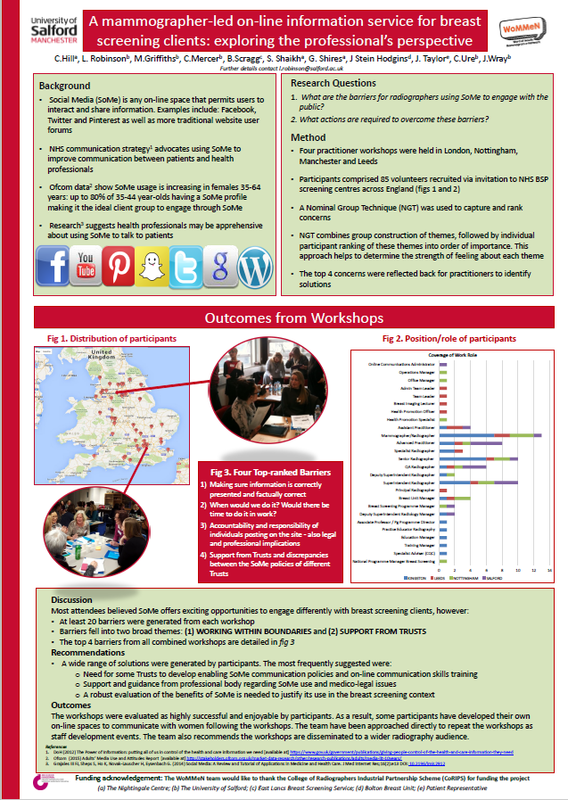 The WoMMeN team have published research in our professional journal Radiography all about issues that we’ve found when working on this project, and we’ve also displayed posters at various events – here are a few of the research papers and academic posters that the team have produced. If you click on the images of the research articles, it will show you the abstract so that you can track it down to read the full article. 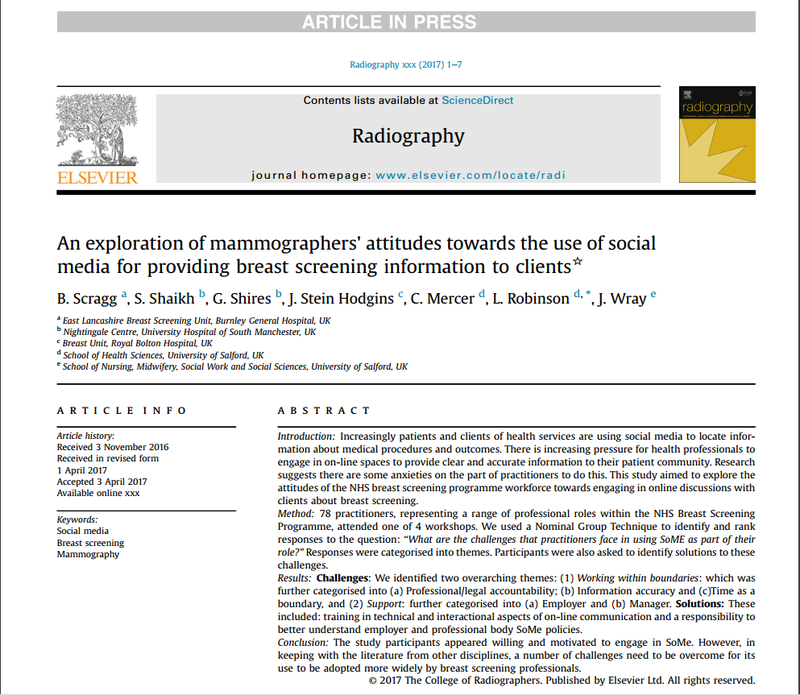 Here’s the research that started it all off – we wanted to know whether breast screening clients even wanted to speak to mammographers online – the answer was yes, and here we are. 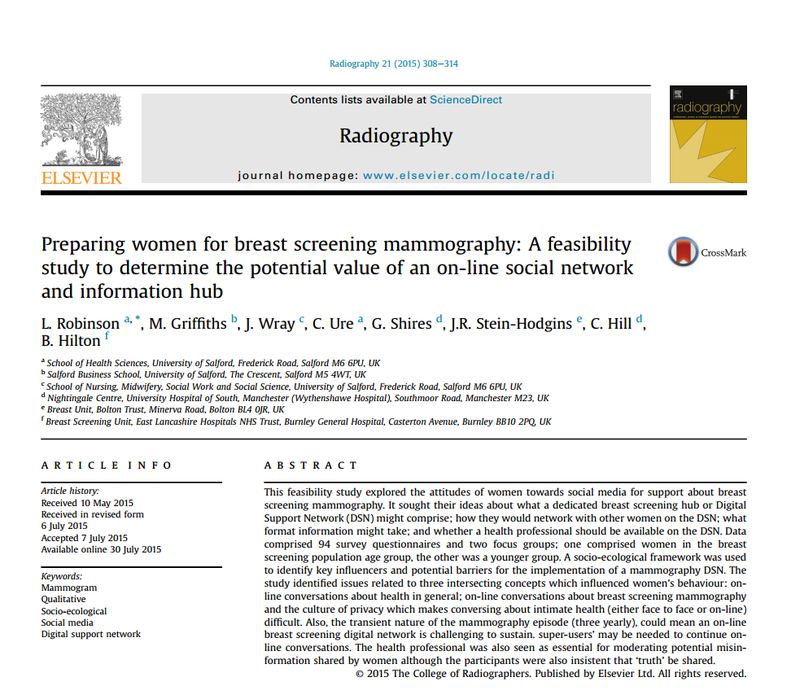 So then we went out to get the views of the mammographers and other people working within the breast screening service. We held workshops around the country, and talked all about the benefits of using Social Media to chat to clients online. 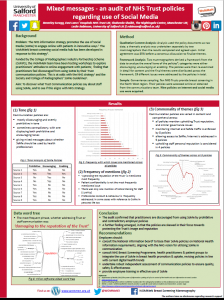 Here’s an academic poster we displayed at the Symposium Mammographicum 2016. 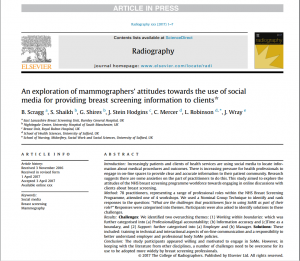 It showed that the workshops included breast screening staff from all over the country, and from a good mix of staff from within the units – not just mammographers wanted to know about the use of social media. 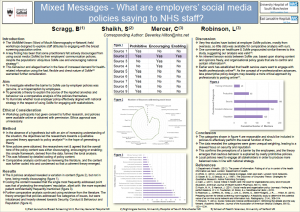 Here’s our next finding: not everyone was convinced their employer would let them talk online. 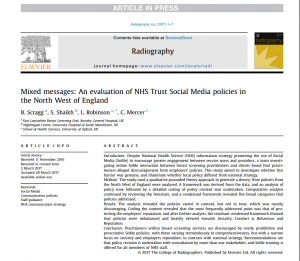 So, we gathered the various NHS Trust policies and studied them. 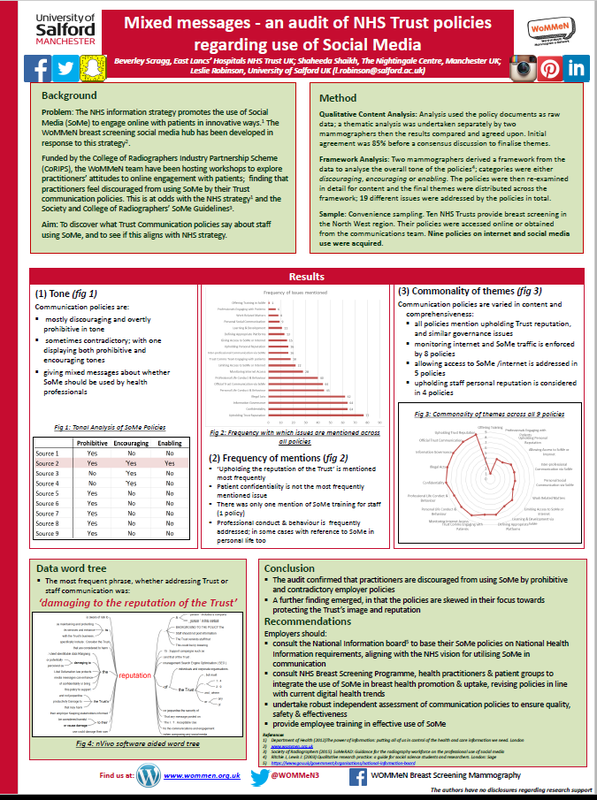 Indeed, we find that there’s a lot of confusing, conflicting instructions – here’s our other poster at the Symposium that year. 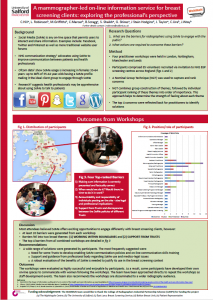 We thought we’d better write this down for posterity – and here are our two research articles discussing what our posters did in more detail. 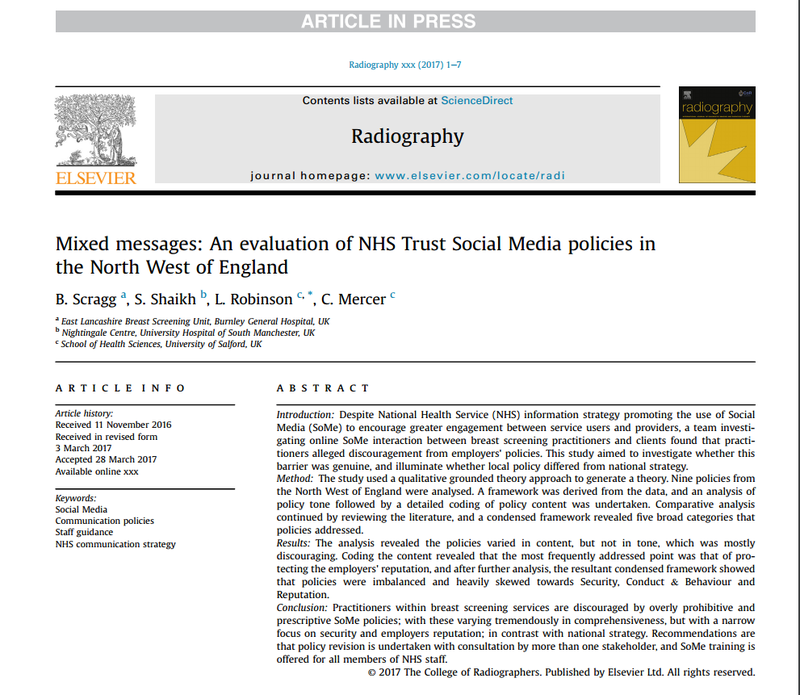 They’ve both been published in Radiography – that’s the journal affiliated with our professional body, the Society & College of Radiographers. 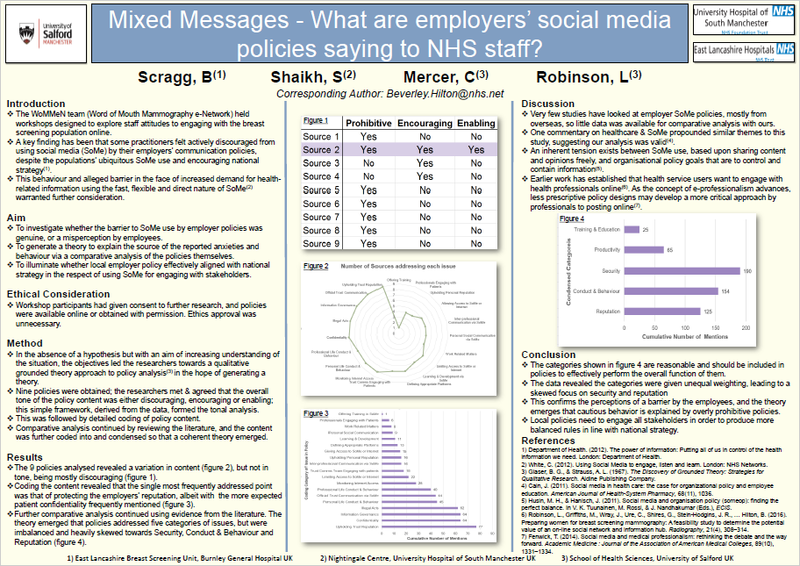 Here’s the final poster, where we did a little more work on the messages coming from the employer’s social media policies – you get the preview, as this hasn’t been displayed anywhere! So there you have it, we’ve built the WoMMeN team and website on solid foundations of research and evidence. Want to know more? Ask us a question! Pop over to the forum, or comment below! 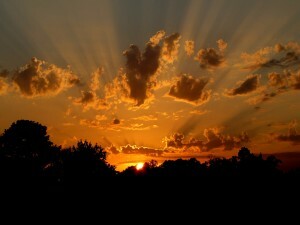 This entry was posted in Evidence Based Practice, New Evidence & Research, WOMMeN the origins! and tagged CPD, research, WoMMeN. Bookmark the permalink.